Dedicate a chunk of your time to creating a charming addition to your model collection! 1966 Chevy Suburban Model Kit is equipped with the parts and pieces to create a 1966 Chevy Suburban with two rows of interior seating, whitewall tire inserts and underside spare tire, and a white mold color that you can cover with your choice of model paints. 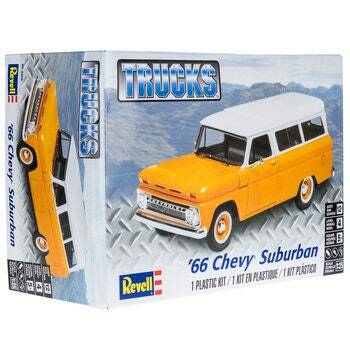 Station it next to the rest of your model cars and trucks to create a collector’s focal point!